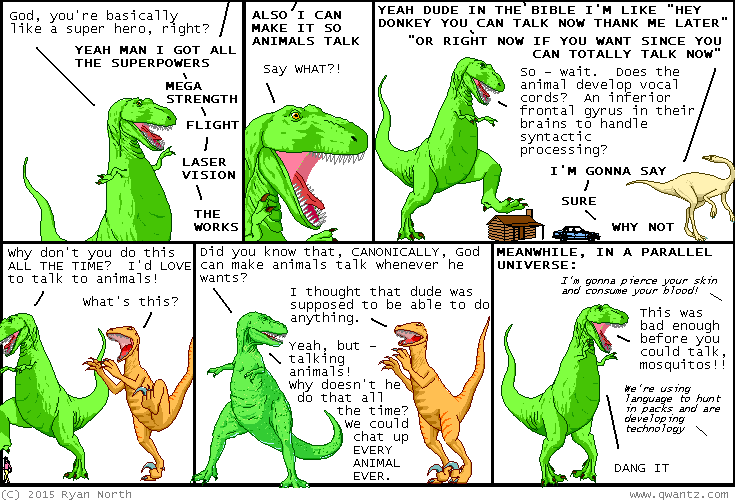 Dinosaur Comics - August 3rd, 2015 - awesome fun times! –Maybe original characters are dumb and I hate them?? August 3rd, 2015: The talking donkey in the Bible never even gets a name! I propose we call her... "Chatty McVocalcords". It is a reasonable name that will fit into the other names in the Bible nicely. One year ago today: These links are SICK. They are DISEASED and CONTAMINATED. They are HELLA VIRAL.